The removal of a controversial mural fails to hide a crime problem. Authorities in Jahor Bahru have covered up a mural painted by Lithuanian street artist, Ernest Zacharevic, a permanent resident nicknamed “Malaysia’s Banksy” by the media. 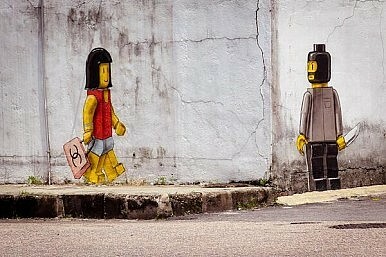 The mural depicted two Lego figures: a woman carrying a designer handbag and a robber wielding a knife just around the corner. The picture stirred controversy by bringing attention to two things that Jahor Bahru is most known for: a Legoland theme park and a high crime rate. “My paintings are always a response to whatever social environment I get exposed to. I noticed many people just feel extremely unsafe. Everyone I talked to—no matter what their situation—would say, ‘Take care of yourself and hide your bag,’” Zacharevic told the BBC. Authorities feared that the artwork would damage the city’s reputation. “It’s vandalism. The robber gives an image that is not good for our country, investment and tourism. If the painting stays, everybody will be scared,” Aziz Ithnin, an official with the Johor Baru City Council, told AFP. Johor Baru’s crime problem became a sensitive topic when officials designated the area as a huge development zone, one that has already attracted billions of dollars in investment commitments. Although the federal government recently released figures showing that crime is trending downward, the statistics were met with suspicion and did nothing to allay fears over a perceived rise in crime. Residents immediately shared pictures of the mural on Facebook and took to social media to share their stories of being mugged or attacked in the city. Some even created their own parodies by Photoshopping Bruce Lee or other objects into the original picture. Local artists even tried to soften the message of the controversial mural by painting in a policeman chasing after the mugger with handcuffs. Despite the addition to the mural, Johor Bahru City Council workers decided to remove the artwork, despite a public outcry.